Remodeling your home never got easier. 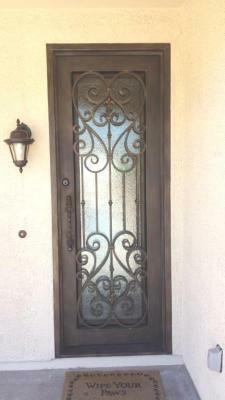 Our technicians just installed this new iron door in Phoenix Arizona. After seeing some of our work on their neighbor’s house, this family contacted us to find out if we had any stock doors in their size. With as many customers as we get who want doors right away, we keep a large inventory with a variety of designs and sizes. They came in to check out our showroom and selected this 38x98 for their home. Your remodel experience is the upgrade you deserve and we make that process pleasurable. Call us and come visit our showroom to find out your iron door options!